I'm a huge fan of the Far Cry series, at least as far back as Far Cry 2. The way the series has approached shooter mechanics in an open (or mostly open) world environment has been a landmark for other shooters still struggling to find their way off their rails. Few other games have, in my opinion, so thoroughly balanced world scale with regular bumps in player engagement. When I saw that Far Cry 5 was playable at PAX this year, I was eager to get a chance to play. First and foremost, Far Cry is a difficult game to demo. Because it's an open world game, it scales better for a long playthrough instead of a 15 minute demo. Still, what I saw was enough to get me excited for the full game early next year. The demo I played is the same one Ubisoft showed at Gamescom. At the beginning I was given a choice of three companions; Nick Rye, the bush pilot who can drop bombs on my enemies, Grace Armstrong, a sniper who prefers to keep her distance, and Boomer, a dog who can attack enemies and bring me equipment he finds in the field. I was torn until I was told that I could pet Boomer. It's in the companions and the way you interact with them that the connections to Far Cry Primal are most apparent. The oft maligned entry to the series seems to have had more influence than most would have given it credit for. 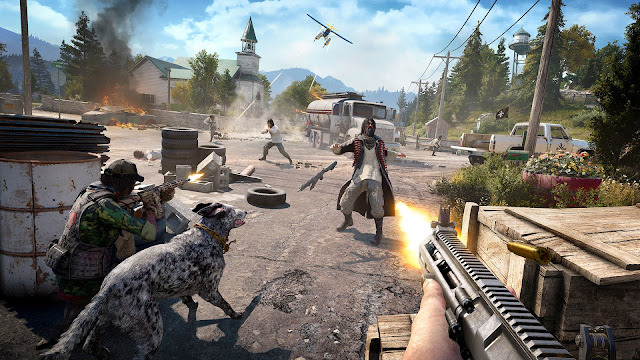 Much like the animal companions in Primal, the companions in FC5 can be given instructions to go to specific locations or attack specific enemies. In Primal, the companion animals had difficulty pathfinding from time to time and would take strange, circuitous routes to enemies no more than a stone's throw away. The larger companions were the worst, with the cave bear getting stuck in some of the narrower passageways or completely filling up a cavern, blocking your view of any enemies in the area. Luckily, the proportions of the companions in FC5 are much more human sized. On top of that, their responsiveness and pathfinding has been greatly improved, at least in so much as my limited time with the game allowed me to evaluate. Boomer, when given a command to attack an enemy, would take the shortest route to the enemy, and provided we were undetected, would crouch and sneak up on the target before striking. More than once, his attack allowed me to pop up amidst the ensuing chaos and quickly pick off the other enemies in the area. Aside from clearing the one area in the middle of town, I was sent to find Nick Rye, the aforementioned pilot and rid him of the cult members attacking his hangar. Once that was complete, I was given control of an airplane and asked to destroy a number of the cult's munitions depots. 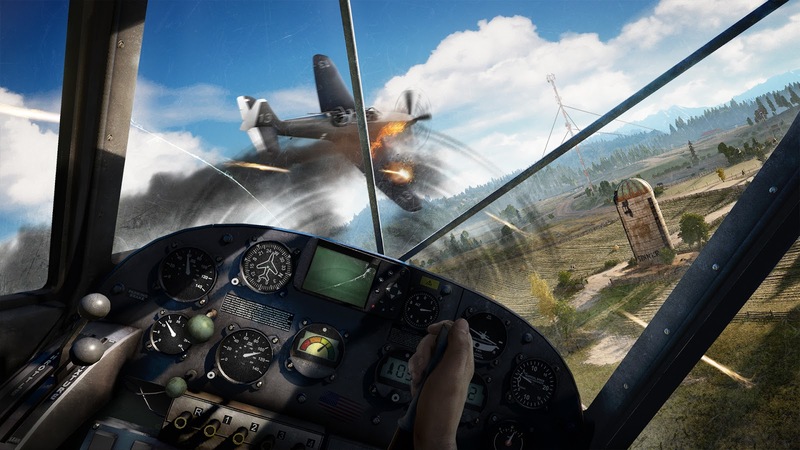 Of all the things I enjoy about the Far Cry franchise, flying has never been among them. The only time I have felt that the flight controls were appropriately responsive was in using the hang-gliders in Far Cry 2 and 3. The plane controls were strange; throttle controls and pitch worked as expected, but when trying to turn/roll left or right, the whole plane just turned in the air like a boat. It felt strange and really broke the immersion that up to that point had been so good. It was a disappointing note to close the demo on, especially given how tight and satisfying the controls had felt up to that point. 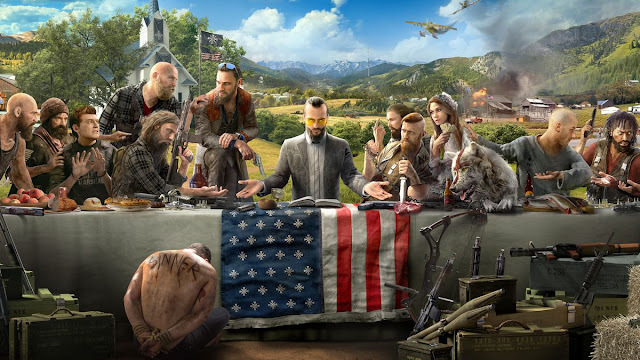 Overall, I can tell you that Far Cry 5 is beyond any shadow of a doubt, a Far Cry game. It feels, sounds, looks and behaves like any other member of the franchise and that isn't a bad thing. I have always felt that the real strength of this franchise lies in the long play. The emergent stories that come from it and the moral grey areas that the narratives typically take have kept me with the franchise for a long time. I remain excited to see where the story goes, even if the christian extremist image of the game's antagonists has been toned down.